Mention Mexican food to an Australian, and most of us will immediately think of corn chips, sour cream and cheese. It's no wonder that Mexican cuisine tends to get a bad rap. In fact, much of what is labelled here as "Mexican", is more Tex-Mex - an American interpretation of Mexican cuisine that spread from Texas and other states in the southwest. Nachos and tacos are as Mexican as, say, pineapple fried rice and sweet and sour pork are Chinese. Victor Pisapia is a huge fan of Mexican cuisine. When he moved to Australia from the United States, he opened the hugely successfuly Rattlesnake Grill. Today he's leading us in a Modern Mexican cooking class through his company VictorsFood. It's easy to dismiss chillies as simply being hot, Victor tells us, but individual chillies have unique flavours and nuances. 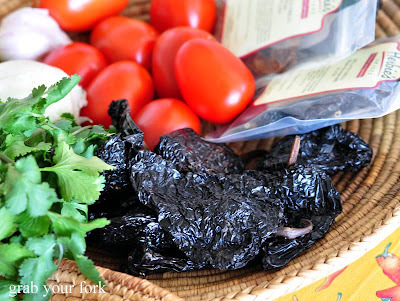 We try slivers of dried ancho chilli which is almost fruity in flavour. Chipotle chilli is smokey, reminding me of smoked paprika. The chipotle is simply a jalapeno chilli that has been smoked. 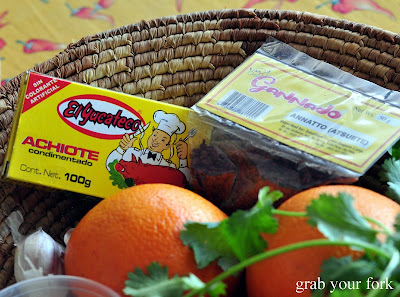 Achiote is an interesting paste made from ground annato seeds from the annato fruit. Its intense red colour meant it was often used by native American Indians as body paint, especially the lips, giving rise to its nickname "the lipstick tree". 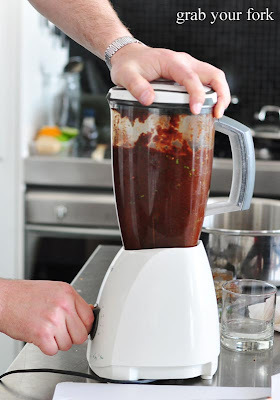 The paste saves much work involved in grinding the seeds, and includes vinegar, salt, garlic and other spices. It's used primarily for rubbing onto pork, but can also be used in stews or rice, and is used in Latin American, Jamaican and Filipino dishes. Plantain bananas are a staple in Mexican cuisine, a starchier cousin to Cavendish bananas, that are best sliced and deep-fried. They have more of a potato or sweet potato texture without the sweetness. Jicama looks like a potato in the shape of a giant garlic bulb. It tastes much like a cross between a potato and a nashi pear, not quite as sweet or juicy as the nashi fruit. The vegetable is popular in Asian cuisine, used in Malaysian popiah fresh spring rolls, and also in several Vietnamese dishes. Whilst we chatted, Victor prepared smoked salmon quesadillas for us to snack on. These, he said, were perfect for dinner parties as they can be prepared in advance and then reheated when guests arrive. Combine the cream cheese with the dill, red onion, salt and pepper. Spread the cream cheese mixture thinly (don't use too much) on a tortilla. 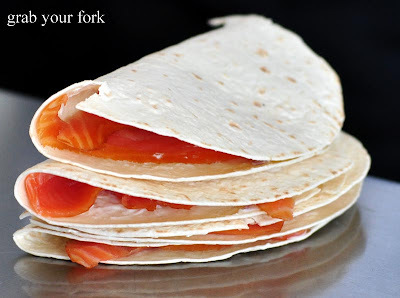 Lay two slices of smoked salmon on one half, then fold over to make a semi-circle and press lightly to flatten. Repeat for each tortilla. Place two quesadillas on a pre-heated non-oiled fry pan or beneath a low-med grill. 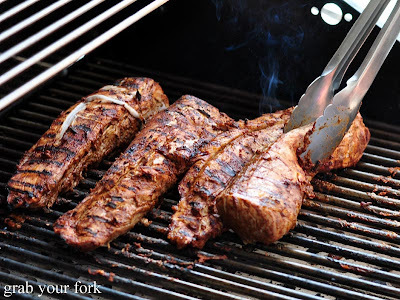 Grill for 1 minute on each side or until lightly golden. Watch them closely as they will brown quickly. Cut the quesadillas into wedges. Top with the combined lime juice and sour cream (pour into a squeeze bottle for artistic freedom). Add fresh lime wedges, capers and a sprig of dill for an optional garnish. And then we were onto the chopping boards. It was an intimate class of six who were delegated to chargrilling capsicums and tomatoes, de-seeding chillies, slicing, dicing and more. The process of making real chilli sauce from dried chillies was particularly intriguing. There was quite a process involved but the resulting sauce was phenomenal in flavour, layered with sweetness and smokiness and only a subtle smouldering heat. Many hands make light work, and within two hours, we were sitting down to a Mexican spread we'd all helped prepare. 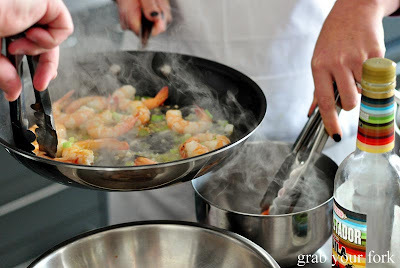 Tequila prawns was the biggest hit of the day. We'd all helped to peel the prawns, Victor showing us how to remove the veins with ease: simply twist the head 90 degrees and then grasp the vein and tug gently so the whole vein is pulled out in one piece. It works a treat! 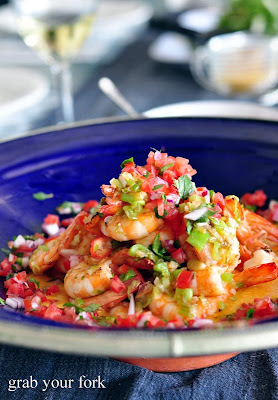 The roasted yellow capsicum sauce was mellow and sweet, a perfect pairing with the fresh prawns, livened by the pico de gallo of diced onion, tomato, coriander and lime. The rocket, jicama and orange salad was fresh, light and perfect for summer. 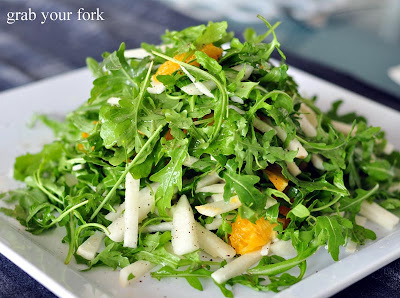 The crisp batons of jicama went so well with the sweet orange segments and peppery rocket. 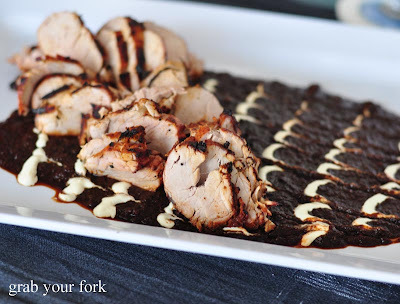 Achiote barbecue pork was tender but the star for me was the red chilli sauce, a deep chocolate brown sauce that was so smoky and aromatic. I could eat this sauce on its own rice, it was so good. I also loved the black bean ragout, the beans tender but textured. I liked the mouthfeel of these beans, a little starchy and strangely satisfying. 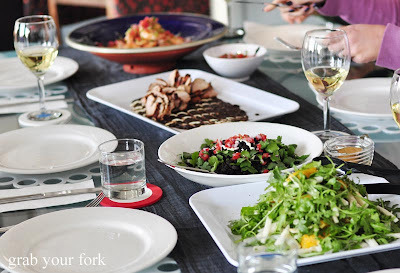 Fresh, flavoursome and exciting, I'm tempted to recreate some of these dishes for a dinner party this summer! 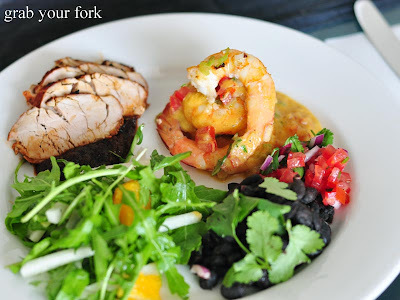 Grab Your Fork attended the Modern Mexican cooking class as a guest of VictorsFood. And the Ninja snakes the first comment! That was highly informative, I've never thought that much about Mexican food before (probably because of its lack of presence here in Australia). The dishes you guys cooked up look mouthwateringly sizzling but I'm still full from a night at sakana-ya so I'll probably come back and drool a bit later in the day. 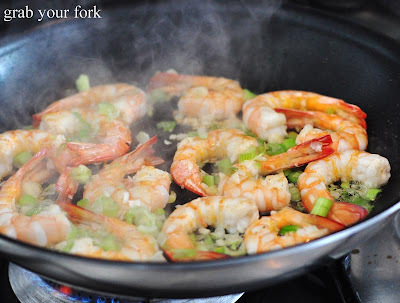 mmm the quesadillas sound awesome and oh how i miss prawns! This sounds like a great experience. I loved the Mexican food when I visited many years ago, and have craved it since. Yes, most of the representations of 'Mexican' in Australia have been very sad. So it was a joy to discover Rattlesnake Grill in the late 90's, then disaster when they closed. 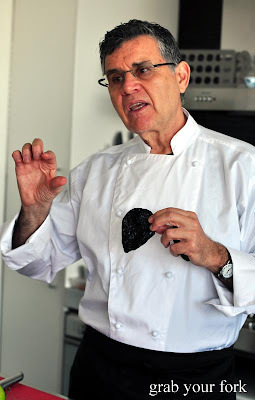 I'm excited to find out that Victor is back on the scene and doing cooking classes! On my way there now to book a class! Yum all the food looks amazing! 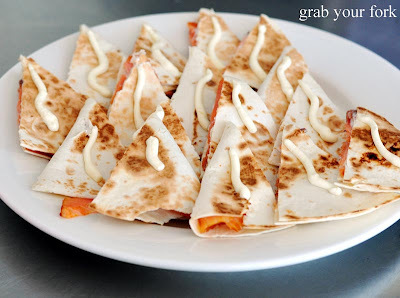 The smoked salmon quesadillas are a great idea. I think I need to get my hands on some real Mexican food as opposed to this Tex-Mex stuff! I've been to Agave, but unfortunately I have to agree with the SMH review (12/20). It wasn't bad, but the dishes were just a bit plain. It wasn't all that flavourful or refined. I think the best Mexican in Sydney is at Guzman y Gomez (it is fresher and more authentic than most places in my native California), but that is just a eat-and-run tacqueria. Azteca's and Cafe Pacifico are fine but simple, mainly serving up burritos, etc. I had high hopes for Agave, but I don't think this is the place that will finally elevate Sydney's Mexican food. Helen, I am incredibly jealous! What a wonderful experience. i love that sauce you guys prepared and the whole feast looks amazing! Hi Ninja - Whoosh, where did you come from? lol. I think Mexican food in Sydney still has a ways to come - I went a little crazy in New York when I found a family-run Mexican restaurant. The black beans were so good! Hi Anon - I agree, it's a shame that we can't find good Mexican or good Tex Mex in Sydney. 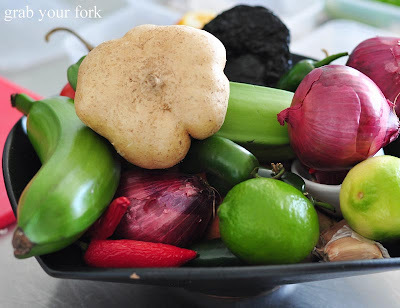 In many ways I think the heat of ours summers is ideally suited to Mexican cuisine too. Hi Miss Dissent - I haven't been to Agave but thanks for the tips. 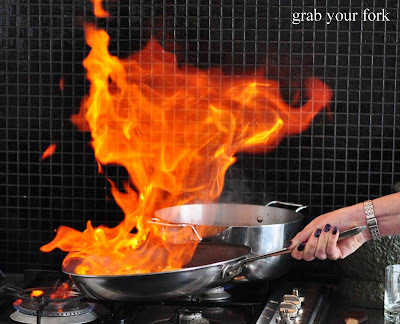 I'm keen to cook some of the dishes again so thanks also for the shopping tip. The chilli sauce was phenomenally good. Hi Jacq - There are a couple of more authentic Mexican snack/lunch spots these days like Mad Mex and Guzman y Gomez. I don't think anything beats homemade though! Hi Bruce - Thanks for your feedback and info on Agave. I think there has been a surge in interest about Mexican particularly with the expansion of both Guzman y Gomez and Mad Mex outlets. Here's hoping there's plenty more! 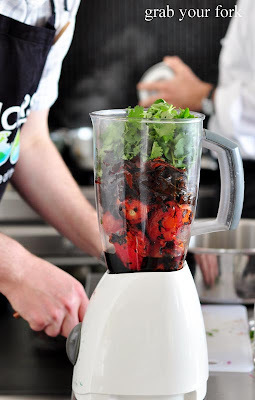 Hi Peter G - The class was much fun and it was such an insight into Mexican cuisine. All the work that goes into the chilli sauce is so worth it! Sounds like a fantastic class. 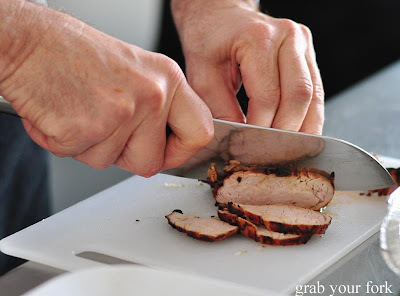 I was lucky enough to interview Victor a few years ago - talk about knowledgeable... It was a huge shame when the Rattlesnake Grill closed - great to hear he's still out there, sharing his love of Mexican food. ahhh... yum! this looks amazing! it looks so fresh and flavoursome, which most of the Sydney "mexican" food is not. 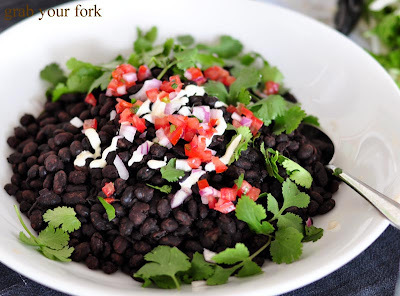 in my experience the mexican food i've tried can be really stodgy - all beans and flour and rice, so you end up feeling pretty heavy by the end. but this looks anything but! Hi Ylla Wright - Victor has a huge amount of culinary knowledge and his passion for Mexican is obvious. Hi Shez - It was lots of fun and gave me a new found appreciation in the value of taking the time to make your own sauces. Hi A Girl Called E - I agree, I love food that is light and fresh, and I found these dishes really invigorating. They'd be perfect over a Sydney summer, especially the jicama salad! Hi Clekitty - The dishes were great. It's interesting how often it just takes a little nudge to realise how much of a cuisine you are truly missing! awesome! Where the heck do you get all those chilis and other ingredients (jicama)? Hi Marian - You can get jicama at Asian grocers. It's also called yam bean. There are a couple of Mexican specialists in Sydney (eg Fireworksfoods) otherwise you can often get them from Essential Ingredient or Herbie's Spices.